THERE'S A meeting for members new to LFB or recently joined, on Thursday 25 October. It's from 6pm at the Camera Museum, Museum St, London WC1A 1LY (map). The nearest Tube is Holborn. It's a chance to get acquainted with other new members, also to meet members of the LFB Committee including some more experienced freelance journalists who can offer advice. 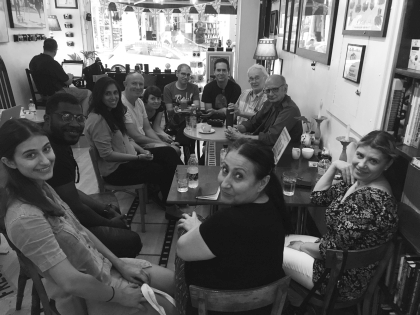 Shown here is a recent and successful new members' meeting at the end of July. Six new members came, as well as two non-members looking to join. Four old hands from the Committee were on hand to share knowledge and experience: the conversation was seen as inspiring and useful. New members asked for information about the NUJ Fees Guide, the Rate for the Job and freelance contracts. If you're a member you can just show up. If you want, you can sign in to attend at the Eventbrite link below.